Many days passed when we posted Refer And Earn App offer, now we have come up with a Short Video Community App, it’s the best app to discover thousands of Indian videos. 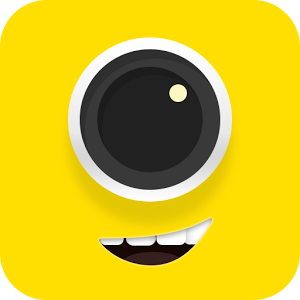 You can express yourself by sharing short video clips Become popular in India, make new friends and interact with people. Not only this you can also Share short videos on Whatsapp and Facebook. 3. Skip Few steps and then click on top left corner button. 5. Enter your 10 Digit Paytm mobile number and click on submit. 6. Your Rs 50 will be credited to Your Account within 2-3 Working days. 8. 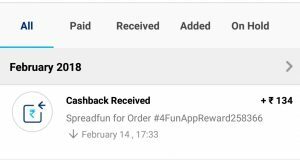 Share 4Fun Refer And Earn offer with your Friends to earn more. For referral link share any video with a friend on WhatsApp. 1. 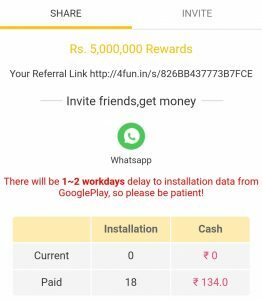 One Installation = Rs.7 Every effective installation by clicking your referral link can win Rs.7. All results are based on statistical data from Play Store of Google. Duplicated installation must be counted for only once. There will be 1-2 workdays delay to installation data from Google, so please be patient! 2. You can withdraw when bonus reaches up to Rs.100, and the withdrawal amount must be multiple of Rs.200. 3. Transfer to an account within 48 hours after the withdrawal application. 4. Do not add deceptive language to attract people to click your referral link. 5. 4Fun Team has the right to block any participants who violated the rules. 6. 4Fun Team has the right to stop the SHARE REWARD PLAN with any participants without reasons.